Discussion at October and November Home and School meetings. A clear-language explanation of the school review process and our consultation plan. A survey, available online and in hard copy. A suggestion box available in the school office. An email address open for comments in the language of the sender’s choice. Encouragement from Home and School members for their friends and neighbours to take part in the discussion. We had 55 responses to our survey about Prince Street School and the school review process. There were no separate comments: all respondents chose to use the survey (online or hard copy) to submit their comments. Interpretations and conclusions that are most relevant for the school review process are in text boxes throughout this report. Respondents indicated they were connected to Prince Street School in a variety of ways. Respondents could select one or more than one way they were connected to the school. 56% (31 people) said they were parents or guardians of Prince Street students. 45% (25 people) said they live in the neighbourhood of Prince Street school. 18% (10 people) said they or a child or children close to them graduated from Prince Street. Others said they have a child or children who may go to Prince Street in the future (6), were family members of students or staff (5), were staff members at Prince Street (3), or were current Prince Street students (1). Numbers add up to more that 55 because people could select more than one category of connection. Respondents were asked to select only one reason their family chose Prince Street Elementary School as their school. Almost half chose the school for the practical reason that they lived in the zone where students could walk or bus to the school. another 9% (5 people) said they chose the school because they feel connected to Prince Street School as part of their neighbourhood. There were one or more responses from others who said they were interested in late French Immersion instead of early immersion (2), they wanted students to go to school with other students in the neighbourhood (2), they enrolled a child at Prince Street before there was the option of a new school at Spring Park (1), they moved to this area because of the schools’ reputation (1), or that they are not in the zone for Prince Street but their student remains at the school for personal or family reasons (1). Four (4) respondents answered “none of the above.” There were 54/55 responses to this question. The school review process and the Public Schools Branch should take seriously the importance of school zone boundaries as the primary deciding factor for most families about where their children will attend school. Changes in school zone boundaries will affect first those families that place the highest value on neighbourhood and lower value on programs (such as French Immersion) available at their local school. “Dedicated staff” was the description with the most support from respondents: 89% of respondents (47 people) respondents selected this term, followed closed by “Accepting,” “Caring,” and “Diverse.” There was also very strong agreement that the school is “Child-friendly” and “Inclusive” (72% for each). These words speak to the emphasis at Prince Street School at building a school community, developing the character of students, and encouraging positive attitudes – as do many of the other words selected by most respondents. E – Empathy (empathetic = 53%). Many of the terms respondents selected relate to the goals of the school review process: “Just the right size of school” (64%); “Building on strengths” (59%); “Meeting students’ needs” (59%); “Positive learning environment” (57%); and “Working towards goals” (57%). The survey results suggest challenges in confidence for Prince Street School, with some perceived challenges for focusing on achievement and quality. Just for example, fewer than half of respondents chose the words “Confident” (40%), “Smart” (40%), “Focused on quality” (45%), or “Hopeful” (47%). 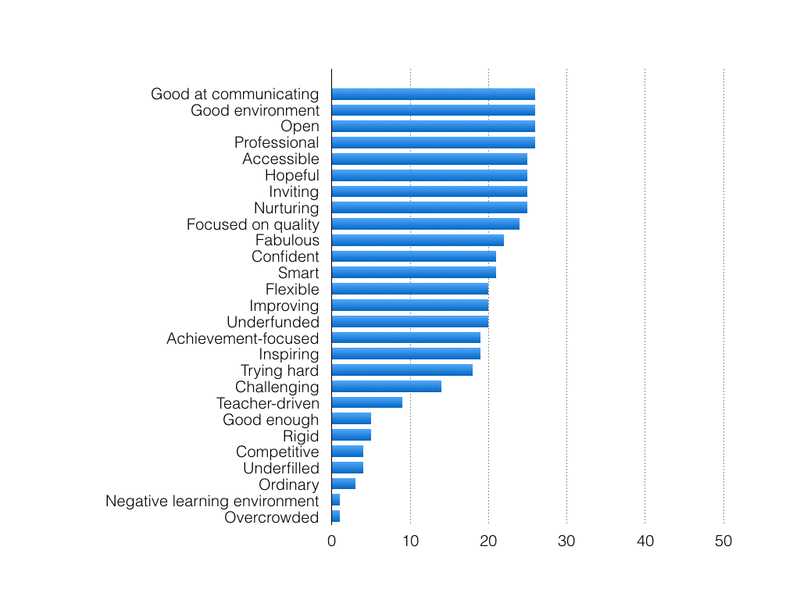 Barely more than a third of respondents selected “Achievement focused” (36%), and fewer than a third selected words such as “Challenging” (26%), though this word might have inspired ambivalent interpretations. Of relevance to the school review process: very few respondents perceive Prince Street Elementary School as underfilled (8%). Far more were likely to perceive it as underfunded (38%). The link between underfilled schools and underfunded schools is not clear or automatic to the respondents to this survey. How connected do you feel to Prince Street Elementary School? 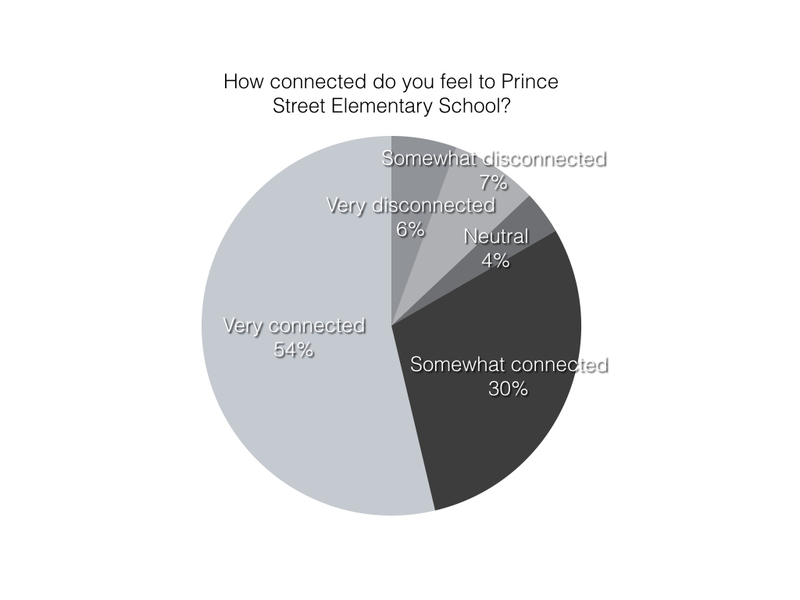 84% of respondents (45 people) reported that they felt very connected or somewhat connected to Prince Street School. How great a sense of belonging do you feel to the community of students, parents and guardians, staff, neighbours, and supporters that surround Prince Street Elementary School? 83% of respondents (44 people) reported that they felt a very strong sense of belonging or somewhat of a sense of belonging to Prince Street School. No one reported a very strong sense of not belonging. In your opinion, how important a part of the downtown neighbourhood is Prince Street Elementary School? If you moved into the area for Prince Street School and had a child of school age, how would you feel about enrolling a child at Prince Street? 85% of respondents (46 people) would feel very happy or somewhat happy enrolling a child at Prince Street. If you had to move to a different area and had a school-age child who had to leave Prince Street School, how would you feel about moving your child to another school? 81% of respondents (43 people) said they would be very unhappy or somewhat unhappy about moving a child to another school. It will be important for the school review discussion to include an understanding of connection and belonging related to the schools under review. Respondents reported high levels of connection to Prince Street Elementary School and a strong sense of belonging. 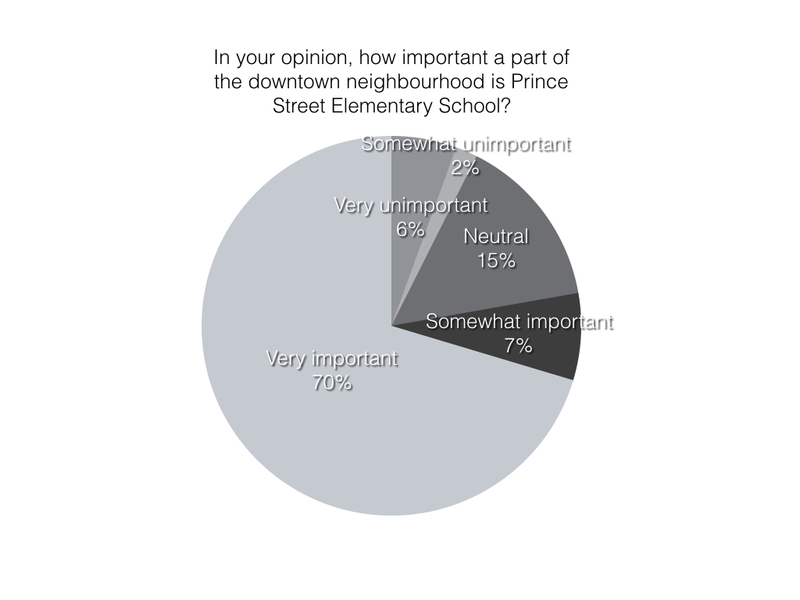 A strong majority of respondents (70%) see Prince Street School as very important to the downtown neighbourhood. Given this perception, engaging neigbourhoods collaboratively in school change decisions is essential to successful future plans for this school. A strong majority of respondents (70%) would be very happy to have a child zoned into Prince Street School; just less than a majority (49%) would be very unhappy to move a child to another school. To put forward a poetic interpretation of the data, the 21% difference between these two results could suggest an effort (or perhaps a struggle) by respondents to express their positive feelings about Prince Street School and their sense of connection and belonging while trying to remain open-minded about changes that will come about as a result of school review. The results should be interpreted as effortful goodwill towards the process – with some wariness, or perhaps a lump in the throat. The next set of questions explored respondents’ values regarding education at Prince Street School and for all of Prince Edward Island. In the next section, not every respondent answered every question, so not every count of respondents adds up to 55. A child can receive a good or bad education in any school. When a school has FEWER students than it was designed for, this has a negative effect on the quality of education and the kinds of learning opportunities at the school. When a school has MORE students than it was designed for, this has a negative effect on the quality of education and the kinds of learning opportunities at the school. It is important to me that students at each school have equitable access to programs and resources: libraries, gyms, schoolyards, English additional language supports, education assistants, and so on. It is important to me for a school to be able to accommodate many kinds of ability and disability. It is important to me for a child to be able to walk to school or have a short bus ride. It is important to me for school changes to make education better for everyone, not just for my family. I believe parents and guardians and families play as big a part in children’s success in learning as the school itself. Schools in neighbourhoods where parents have fewer resources should get more resources than schools in neighbourhoods where parents have many resources. I believe that schools are responsible to contribute to children’s health including things such as adequate nutritious food and opportunities for exercise. I value a school community with a lot of diversity: a range of different cultural backgrounds, ethnicities, sources and levels of income, languages, and experiences. I expect schools to provide mental and emotional supports for students to have good mental health and good skills to cope with stress and anxiety. What children are learning in school meets my expectations about what they should learn in school. I feel confident that Prince Street students will graduate from Grade Six with the basic literacy and numeracy skills expected for Grade Six students. I feel confident that Prince Street students will graduate with the highest level of literacy and numeracy they are able to achieve. I am hopeful about the Prince Edward Island education system. 1 - A child can receive a good or bad education in any school. Almost three-quarters, 74%, of respondents (39 people) somewhat agree or strongly agree that a child can receive a good or bad education in any school. 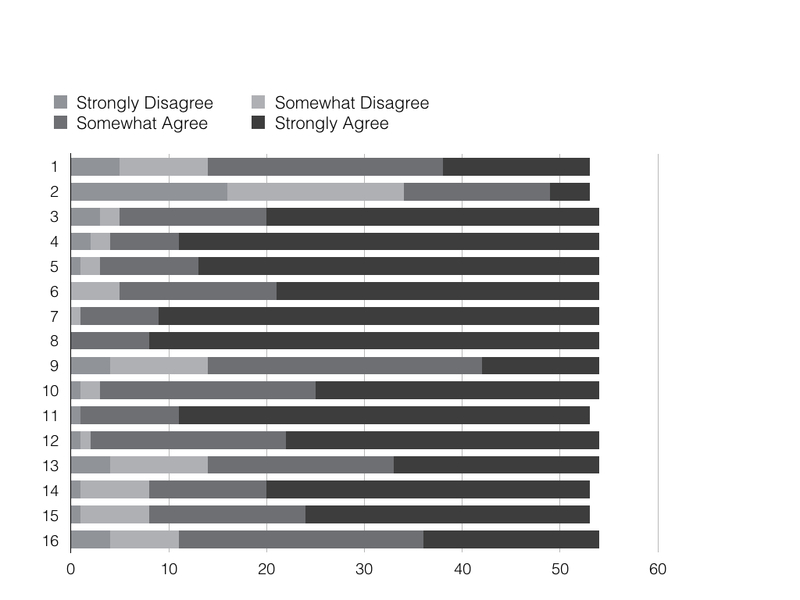 However, most of the respondents who agree with the statement (24 people) only somewhat agree, so there is some nuance to their agreement that isn’t captured in the survey. 2 - When a school has FEWER students than it was designed for, this has a negative effect on the quality of education and the kinds of learning opportunities at the school. Just over one-third, 36%, of respondents (19 people) somewhat agree or strongly agree that when a school has fewer students than it was designed for (is under-filled), this has a negative effect on the quality of education and the kinds of learning opportunities at the school. Very few respondents (4 people) strongly agree that there are negative effects from a school being under-filled. 3 - When a school has MORE students than it was designed for, this has a negative effect on the quality of education and the kinds of learning opportunities at the school. A very strong majority of nine out of ten, 90%, of respondents (49 people) somewhat agree or strongly agree that when a school has more students than it was designed for, this has a negative effect on the quality of education and the kinds of learning opportunities at the school. Among those who agree, more than double the number of respondents strongly agree (34 people) than somewhat agree (15 people). It is clear from respondents’ reactions to underfilled versus overcrowded schools that it is much easier to make a clear and convincing case that overcrowded schools have a negative effect on quality of education than underfilled schools. This has significant implications for decisions about school review and also should inform communications to parents, guardians, and school communities about school changes. The Public Schools Branch will need to make a more compelling and convincing case about the negative effects of underfilled schools to win over skeptical school communities. 4 - It is important to me that students at each school have equitable access to programs and resources: libraries, gyms, schoolyards, English additional language supports, education assistants, and so on. A very strong majority of more than nine out of ten, 92.5%, of respondents (50 people) somewhat agree or strongly agree that it is important that students at each school have equitable access to programs and resources such as libraries, gyms, schoolyards, English additional language supports, education assistants, and so on. Among those who agree, 86% (43 people) strongly agree. 5 - It is important to me for a school to be able to accommodate many kinds of ability and disability. Respondents were getting close to unanimous — 94% of respondents (51 people) — in somewhat or strongly agreeing that it is important for a school to be able to accommodate many kinds of ability and disability. Among those who agree, four times as many strongly agree (41) as somewhat agree (10). Equity and inclusion are expressed as Prince Street School values very consistently among respondents. The Public Schools Branch will want to make a case for how any proposed school changes affect equity and inclusion. 6 - It is important to me for a child to be able to walk to school or have a short bus ride. A very strong majority of nine out of ten, 90%, of respondents (49 people) somewhat agree or strongly agree that it is important for a child to be able to walk to school or have a short bus ride. Among those who agree, double the number strongly agree (33) as somewhat agree (16). As noted throughout this survey, distance from school is not only linked to transportation and children’s health and comfort but also to family engagement with the school. 7 - It is important to me for school changes to make education better for everyone, not just for my family. Respondents were very close to unanimous — 98% of respondents (53 people) — in somewhat or strongly agreeing that it is important for school changes to make education better for everyone, not just for their family. Among those who agree, more than five times as many strongly agree (45) as somewhat agree (8). Almost to a person, respondents express the desire to put collective goals ahead of individual goals. Almost to a person, respondents express a wish be open-minded and broad-minded about school review and school changes, as long as they make education better for everyone. 8 - I believe parents and guardians and families play as big a part in children’s success in learning as the school itself. Respondents were 100% unanimous in somewhat or strongly agreeing that parents and guardians and families play as big a part in children’s success in learning as the school itself. Six times as many respondents strongly agree (46) as somewhat agree (8). This is the response with the strongest consensus on the survey. The response underscores the importance of engaging parents, guardians, and families with schools and engaging them as vital partners in the future of education in PEI. School changes must reduce, not increase, barriers to family engagement in learning. 9 - Schools in neighbourhoods where parents have fewer resources should get more resources than schools in neighbourhoods where parents have many resources. About three-quarters, 74%, of respondents (40 people) somewhat agree or strongly agree that schools in neighbourhoods where parents have fewer resources should get more resources than schools in neighbourhoods where parents have many resources. Among those who agree, more than twice as many somewhat agree (28) as strongly agree (12). There is a great diversity in socio-economic background among Prince Street School students, and this diversity is considered a strength at our school. However, there is no denying that Prince Street School community on the whole has fewer resources than the communities around some other schools. Prince Street Home and School members have frequently observed that raising $2,000 at our school is a very different and more difficult project than raising $2,000 at some other Charlottetown schools. Nonetheless, respondents from Prince Street School will on the whole be satisfied with a fair and relatively equal distribution of resources to schools and are not making a strong socialist case for equity of distribution based on comparative need. 10 - I believe that schools are responsible to contribute to children’s health including things such as adequate nutritious food and opportunities for exercise. Respondents were getting close to unanimous — 94% of respondents (51 people) — in somewhat or strongly agreeing that schools are responsible to contribute to children’s health including things such as adequate nutritious food and opportunities for exercise. Among those who agree, those who strongly agree (29) slightly outnumber those who somewhat agree (22). The strong support for a central role for schools in contributing to children’s health through nutrition and exercise is very likely connected to the Prince Street community’s awareness that there are too many students at our school who are hungry. There are many students at our school whose families cannot offer them many extracurricular sports opportunities. It is hard to be part of the Prince Street School community and not see these challenges and see a role for schools to make children’s lives better, richer, and healthier. Comparing the response to this question with the response to the previous question, it can be surmised that the Prince Street community supports initiatives that are universally available for the benefit of many and integrated into all schools rather than supports that are based on one school’s needs. 11 - I value a school community with a lot of diversity: a range of different cultural backgrounds, ethnicities, sources and levels of income, languages, and experiences. Respondents were very close to unanimous — 98% of respondents (52 people) — in somewhat or strongly agreeing that they value a school community with a lot of diversity, such as a range of cultural backgrounds, ethnicities, sources and levels of income, languages, and experiences. Among those who agree, more than four times as many strongly agree (42) as somewhat agree (10). As expressed throughout this survey, diversity is a central value, if not the central value, of the Prince Street School community. 12 - I expect schools to provide mental and emotional supports for students to have good mental health and good skills to cope with stress and anxiety. Respondents were very close to unanimous — 96% of respondents (52 people) — in somewhat or strongly agreeing that they expect schools to provide mental and emotional supports for students to have a good mental health and good skills to cope with stress and anxiety. Among those who agree, more than one-and-a-half times as many strongly agree (32) as somewhat agree (20). Respondents have very high expectations of schools and education systems, including support for the mental health and wellbeing of students as much as for physical health and wellbeing. 13 - What children are learning in school meets my expectations about what they should learn in school. About three-quarters, 74%, of respondents (40 people) somewhat agree or strongly agree that what children are learning in school meets their expectations about what they should learn in school. Among those who agree, the field is fairly evenly split between those who somewhat agree (19) and those who strongly agree (21). It would be fascinating to learn more about what parents’ exact expectations are about what students should learn in school and where schools meet those expectations and where they fall short of them. 14 - I feel confident that Prince Street students will graduate from Grade Six with the basic literacy and numeracy skills expected for Grade Six students. About 85% of respondents (45 people) somewhat agree or strongly agree that they feel confident Prince Street students will graduate from Grade Six with the basic literacy and numeracy skills expected for Grade Six students. Among those who agree, close to three times as many strongly agree (33) as somewhat agree (12). 15 - I feel confident that Prince Street students will graduate with the highest level of literacy and numeracy they are able to achieve. About 85% of respondents (45 people) somewhat agree or strongly agree that they feel confident Prince Street students will graduate from Grade Six with the highest level of literacy and numeracy they are able to achieve. Among those who agree, just under two times as many strongly agree (29) as somewhat agree (16). The same number of respondents feel confident that students will graduate from Prince Street School with the basic literacy and numeracy expected for their grade as feel confident that students will reach the highest level of literacy and numeracy they are able to achieve. However, there is a difference in the level of confidence between these two questions. Fewer respondents expressed strong confidence that students will reach the highest level they are able. This may point to challenges of achievement both for students with modified programs who are not expected to meet the same levels of literacy and numeracy as their peers and for high-achieving students who may need enrichment opportunities to meet their highest levels of ability. 16 - I am hopeful about the Prince Edward Island education system. About eight out of ten, 80% of respondents (43 people) somewhat agree or strongly agree that they are hopeful about the Prince Edward Island education system. More somewhat agree (25) than strongly agree (18). We thought the Public Schools Branch would be interested in the results of this question. Almost half of respondents — 26 out of 55 — took the time to add narrative comments at the end of the survey. Comments have been summarized and edited to take out any identifying information. Almost a quarter of the commenters, 6 people, had positive comments about friendly, dedicated staff. Two commenters used the phrase “above and beyond” in describing school staff’s efforts on behalf of their children. The need for adequate numbers of staff and teachers with support and resources was an explicit theme in 2 comments and implicit in others. - A desire to see the neighbourhood and school more integrated. - The need for emphasis on physical education and longer times for play. - A concern about “social promotion” from a commenter who thinks its effects are negative. - A concern about keeping high-achieving students engaged. A few comments were addressed directly to the school review process. This last statement seems a valuable summary of the central themes of the survey and the hopes and concerns of many who responded.